In 2008, amidst the throes of the Great Recession, Ben Edmunds decided he wanted to work in beer. He taught high school Spanish in Colorado, but wasn’t completely fulfilled. He went back to school himself and graduated from the Siebel Institute, studying in Chicago and Munich, earning a training that was supposed to put him on a path to “seek greater opportunities,” according to the school’s website. It all led him to Portland, Oregon. His first job as a brewer at Upright Brewing found him doing a little bit of everything—production, packaging, kegging beer, and more—for $14/hour, 25-30 hours a week. That led to his break in 2010, when he joined Breakside Brewery, taking on the head brewer role. He was going to make about $35,000 annually. “It was enough, but it wasn’t ideal,” he says of his wage. 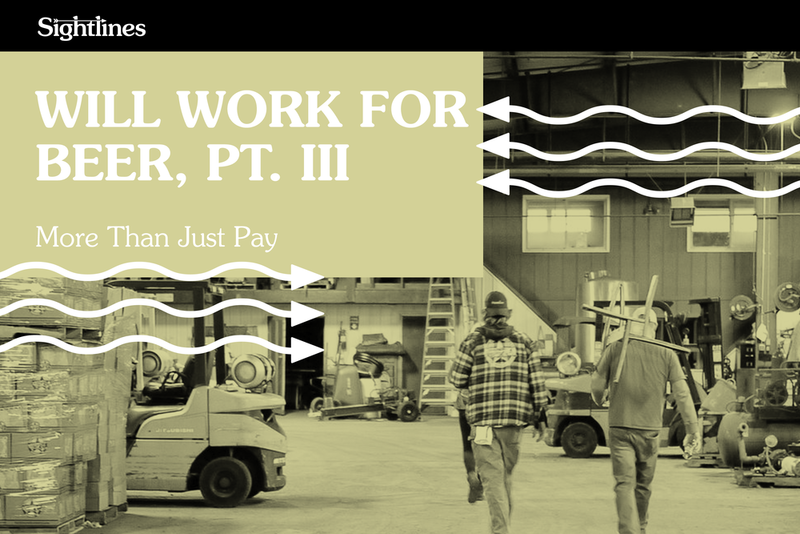 The way Edmunds saw it, he could have started a brewing career at the bottom, making minimum wage as a keg washer, or go the more professionalized route. Today, as brewmaster for Breakside, the path he took isn’t forgotten. Keg washers start at $15 an hour, $3 more than Portland’s mandated minimum wage will be after an increase to $12 this summer. Production staff can expect to be earning “mid-to-high 30s,” and they get overtime pay after about a year. That’s on par for what an average "production" worker earns in the Portland metro area, according to MIT’s Living Wage Calculator. It's all part of recognizing a sometimes-awkward balance that takes place in beer: passion leads people into the industry, but there's also an understanding it's most likely not going to get you rich. But as wage equality and social issues gain more space in public consciousness, it's clear that brewers and taproom staff aren't meant to be destitute for their love, either. "Any industry driven by passion is going to have this same struggle," Modern Times CEO and founder Jacob McKean tells GBH. "But just because you can get away with poor compensation doesn't mean you should." “If we just churned through minimum-wage employees, we never would have gotten where we are today,” he adds. The core truth is both a poor-tasting medicine and the sugar that makes it go down. From its earliest days, American craft beer has created its mythology on the theme of a plucky upstart putting it all on the line to follow a dream. This attracts people to join the industry by the thousands, whether just out of school or transferring from other professions. The story is strong, but the reality is, too. You’re likely to start at the bottom, not make a lot of money, and wait your turn. McKean added that a new “era” of consideration for employees wasn’t far off, which itself has been an important change. As many people search for a job that fulfills a desire to “do what you love,” the culture created around small breweries is meant to provide the kind of soft benefits that attract and keep workers. It can be a plus for employees, but companies also gain from maintaining institutional knowledge. At Breakside, new hires with zero experience take about 15 months to get fully trained as a cellarman, while those with one or two years in the industry may come on as brewers or cellarmen as well. From the start, Edmunds says he has an expectation of a new employee to work at the brewery for two to three years. At an employee’s first annual review, there’s a conversation around goal setting to get someone on the track to what they want to accomplish professionally. Whether it’s quality control, barrel-aging, research and development, brewing, or managerial work, the idea is to point them in the direction within Breakside’s team to both build skills and deepen connections to the business. It’s a similar case for Doug Reiser, COO and co-founder of Asheville, North Carolina’s Burial Beer Co. “Finding good employees is the hardest thing on the planet," he says. "When you get great ones who give all their effort every day, have a great work ethic, and care about other team members, you do everything you can to keep them happy." That comes in two big sells to staff. First, Burial traditionally promotes from within, so putting in time typically comes with chances to move up. When Burial needed a new production brewer, current employees were bumped up the chain, from cellarman to swing brewer to lead brewer to production brewer. A new person was hired to fill the cellarman spot. Another key to retention comes from hosting internal events, which function as social opportunities to blow off steam as much as a reason for team building. Seasonal festivals, holiday parties, travel to conferences and events, and even collaborations are excuses to come together. Whenever an outside brewery comes to Asheville for a collaboration brew, Reiser gets five staff members to join his production team and visitors for special dinners and time together as a way to meet, greet, and share knowledge. Burial, Breakside, and Modern Times all maintain variations of traditional benefits from 401(k) retirement plans to health insurance and time off. McKean is particularly proud of his company’s ability to provide unlimited paid time-off as well as a two-month paid sabbatical after five years of employment. The ultimate goal, especially for a growing company, is to create an atmosphere where staff members aren’t chewed up and spit out. In an industry that’s part manufacturing and part leisure/hospitality, it’s an ironic mix of two areas that have regularly had the longest and shortest average tenure lengths in major American job categories, according to the Bureau of Labor Statistics. It can also be a tough mix, though. "I hope that we're leading change to ensure that brewers are getting paid more money and being treated like professionals," Reiser says. "It's something we're trying to do, and our goal is to continue to raise salaries as much as we can and be leaders for that." The answer, of course, comes back to the idea of passion. The camaraderie felt among brewery workers and those across the industry doesn’t hurt, either. Often, those trying to break into beer put it succinctly: for better or worse, they just can’t see themselves doing anything else. In part four of this series, we’ll hear from them.